On the nose much, Gilligan, you lousy hack? AMC’s “Breaking Bad” (showrunner: Vince Gilligan) is a surprisingly ham-fisted critique of the Fed’s expansionary monetary policy, badly concealed inside an implausible crime story and tedious domestic drama. The effects of inflation run throughout the series, usually reflected in the increasingly futile efforts of Walter White (Bryan Cranston) to secure his family’s future by earning more and more money that seems more and more worthless. In the end, Cranston is literally left with a barrelful of cash in the New Hampshire wilderness, forced to spend tens of thousands of dollars for each month’s basic supplies. The rising price level is also represented in more concrete ways. 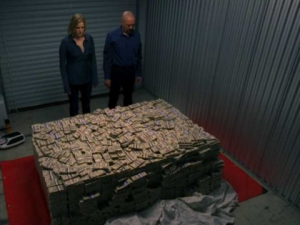 For instance, in season 1 the street price for a stolen barrel of methylamine is given as $10,000. Assuming a standard 55-gallon drum, this works out to $182 per gallon. By season 5 (less than 1 year later), Walter White and friends are offered $15,000,000 for 1,000 gallons of the stuff; this works out to $15,000 per gallon, or an inflation rate of over 149% per month.